There are estimated to be over 5,000 breading pairs of Red Grouse on the heather covered moorlands of the Dark Peak area of the Peak District, so it is not unusual to see them on our guided walks. The males can be instantly recognised by their distinctive red ‘eyebrows’. Great places to see them include popular walking areas such as Kinder Scout, Bleaklow, Derwent Edge, and Stanage Edge. Book onto any of our open group moorland guided walks for a good chance of seeing them and hearing their unmistakable call. After several days of rain, the high moorlands in the Peak District are looking beautiful. The peat bogs which has been drying out are now wet and spongy again. Ling heather is just starting to come into flower, and bilberry bushes are starting to bear fruit. We have seen an unusually large number of young red grouse this week on Stanage Edge, Bamford Moor, and on Kinder Scout. We have also seen several Golden Plover, known as the ‘watchmen of the moors’. 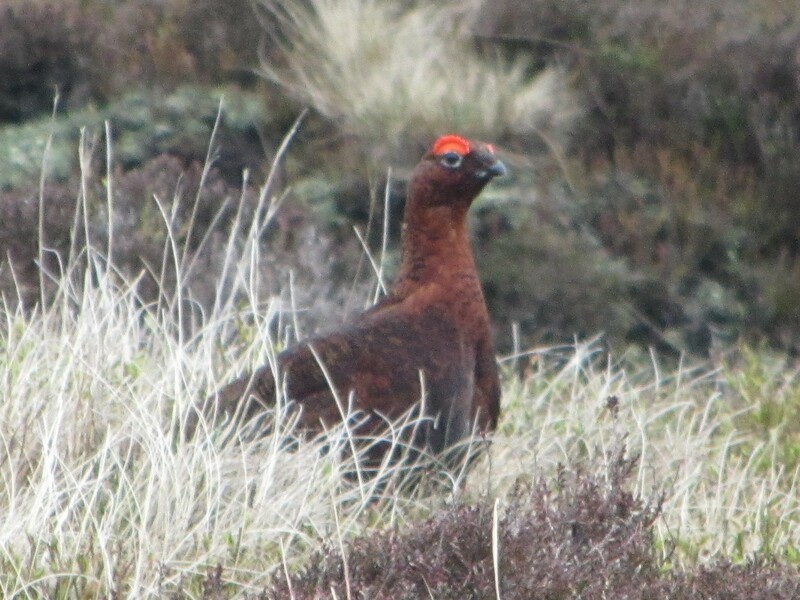 We saw our first red grouse chicks of the year today on our walk on Kinder Scout. Only just hatched out I would guess. There are estimated to be over 5,000 breading pairs of Red Grouse in the Peak District, so it is not unusual see see them on our moorland walks. The males can be instantly recognised by their distinctive red ‘eyebrows’. It really was a great day to be out walking, with brilliant sunshine, fantastic views, but temperatures well below freezing. Why not try our ‘Dramatic Derwent’ guided walk onto Derwent Edge yourself?